The information in this post are sponsored by derma e. As always, all opinions are my own. 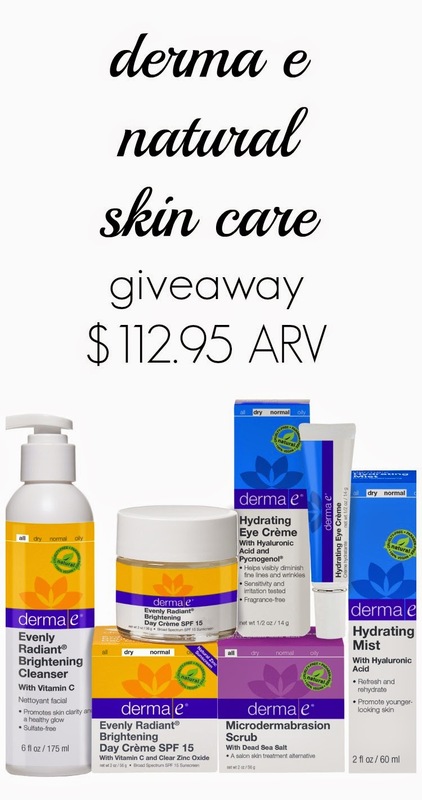 I am so excited to offer you a chance to win $112.95 worth of derma e green beauty products! Derma e is a natural skin care line. They are vegan and cruelty-free. They are also free of mineral oil, lanolin, gluten, GMOs, sulfates, and parabens. Derma e is a family owned company that has been in business for 30 years. They specialize in antioxidant, vitamin-rich skin care. Even their manufacturing process is green, and they are 100 percent offset by wind power. derma e Evenly Radiant Brightening Cleanser ($15.50 value) - A sulfate-free skin brightening daily cleanser. derma e Evenly Radiant Brightening Day Creme ($29.95) - This has an SPF of 15 to protect your skin from sun damage. It also helps even skin tone and brighten skin. derma e Hydrating Eye Creme ($21.50) - This eye cream has hyaluronic acid, which can help reduce wrinkle area, depth, and volume. It hydrates and firms the delicate eye area. derma e Hydrating Mist ($13.50) - This mist hydrates skin on your body or face. derma e Microdermabrasion Scrub ($32.50) - This salon quality treatment sloughs away dead skin cells to reduce acne scars, fine lines, and wrinkles.